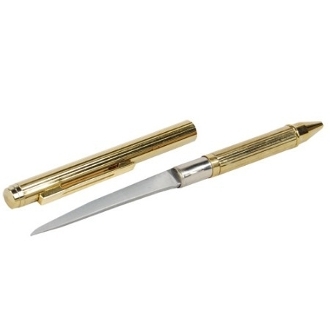 Pen Knives are actual writing pens, that conceal a blade, which could save your life. Even if you never need to use it, it’s better to have one and not need it, than to need one and not have it. These "look like" an ordinary, fancy pen for writing, but each pen features a 2.13 inch blade that is revealed by pulling the pen apart. This is a great way to carry some sort of a self-defense gadget with you, and as long as you won’t be walking through a metal detector, you will be fine. These can also come in handy in many other situations. You buy a new pair of sunglasses, and they have that little tag attached by the piece of plastic that is impossible to rip with your fingers. Maybe you buy something else at the store, and when you get outside, the package is so strong, you need a blade to open it. Try it out!